Salt Fish Girl is the mesmerizing tale of an ageless female character who changes shape and form through time and place. Told in the beguiling voice of a narrator who is fish, snake, girl, and woman– all of whom must struggle against adversity for survival– the novel is set alternately in nineteenth-century China and in a futuristic Pacific Northwest. At turns whimsical and wry, Salt Fish Girl intertwines the story of Nu Wa, the shape-shifter from Old China, and that of Miranda, a troubled young girl lving in the walled city of Serendipity circa 2044. Miranda is haunted by traces of her mother’s glamorous cabaret career, the strange smell of durian fruit that lingers about her, and odd tokens reminiscent of Nu Wa. Could Miranda be infected by the Dreaming Disease that makes the past leak into the present? 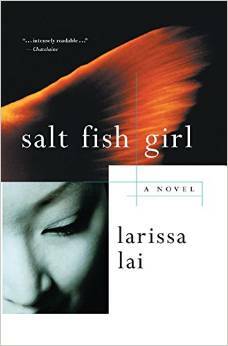 Framed by a playful sense of magic realism, Larissa Lai’s Salt Fish Girl reveals a future where corporations govern cities, factory workers are cybernetically engineered, middle-class labour is a video game, and the power of capital surges in our very veins. Rich with Chinese mythology and cultural lore, this remarkable novel is about gender, love, honour, intrigue, and fighting against the dark forces of biotechnology.